The fishing machine FORTUNA is a 32’ Holland, custom built in “2003” for charter fishing. She is diesel powered and loaded with the best electronics and the finest profesional fishing gear. All reels are Shimano and Penn matched with custom CMS rods. The Fortuna is a real fish magnet for Tuna and Shark. Fortuna is also the perfect fishing platform for Striped Bass and Bottom Fishing for Cod on Stellwagen Bank and the shoals of Cape Cod. Comforts include: bathroom, 2 bunks, plenty of inside seating for up to six passengers, a large deck and fly bridge for fishing and whale watching. U.S.C.G. Safety Equipped for Offshore fishing. The Fortuna is a well known icon on Stellwagen Bank and Mass Bay famous for her ability to catch Bluefin Tuna and many other species of fish through out Cape Cod. 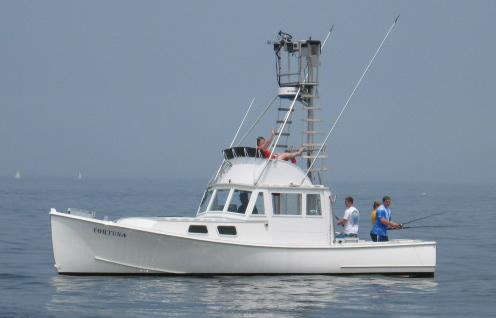 Go Deep Sea Fishing aboard one of Mass Bay Guides Charter Fishing Fleet or Hire a Sport Fishing Guide in your own boat. We are located in the picturesque fishing harbor of Scituate Massachusetts. We are Available 7 Days a week! Go: Shark fishing, Cod fishing, Tuna fishing, Haddock fishing, Striped Bass fishing, Mackerel fishing, Halibut fishing, Whale watching.